Big Aluminium Box Widely demanded as a protective case, this Set Of 6 is widely acknowledged to be perfect in finish and high in performance. 1pc - 3" x 7/8"
1pc - 1 1/4" x 3/4"
10pc - 5/8" x 3/4"
We offer fine quality of handmade aluminium box. This designed and decorative box is embellished with fine beads, stones and other decorative accessories. This box gives ethnic and traditional touch. It is a delight to keep jewellery, rings, kumkum, or chocolate in these boxes. This is an ideal gift item for return gifting purpose. To meet the variegated demands of clients, we are engaged in offering Aluminium Cylinder Box. 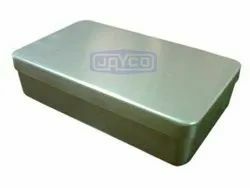 This Aluminium Cylinder Box is highly appreciated amongst customers for its dimensional accuracy and rugged construction. Our product range is widely demanded in different industries. These box are used for storing and displaying beads, precious stones and diamonds. These is made up of aluminum. Contains small tins for storing. We offers Aluminum Midwifery Boxes used in medical section. These are made of aluminum midwifery boxes. The products we offer are of high quality and reasonable price. SIZE : 90 X 45 X 45 C.M. 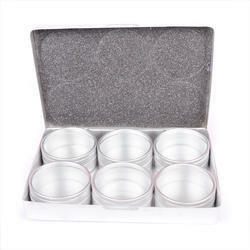 Aluminum boxesThese box are used for storing and displaying beads, precious stones and diamonds. These is made up of aluminum. Contains small tins for storing.